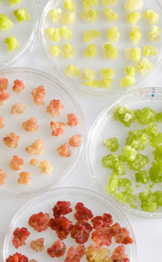 Strains of the VTT Plant Cell Culture Collection are accessible to customers upon request and are under the general conditions concerning the delivery and use of the strains, VTT Material Transfer Agreement, if necessary amended with additional conditions already attached to the biological material. Customer accepts the terms and conditions of VTT Material Transfer Agreement by placing an order to VTT. The customer should be a competent legal entity, established under the laws and regulations obliged to it. Please contact plant.collection@vtt.fi for further details. The packing unit per order for one cell line consists of two Petri dishes (90 mm in diameter) inoculated with callus and two more Petri-dishes containing fresh solid medium. Suspension cultures are delivered in a 50 ml plastic screw cap tube containing 40 ml suspension. Within Finland cultures are delivered by mail. Outside Finland delivery is carried out by a courier service. Special delivery for highly sensitive cultures by a parcel service which guarantees arrival overnight can be arranged on request at the expense of the client. Shipments comply with international regulations concerning transport of biological material. Therefore, shipments to certain destinations may be subject to an additional surcharge and deliveries to some destinations cannot be undertaken. It is the responsibility of the customer to check the import regulations for the species ordered. When living cultures are mailed there is always a risk of damage. VTT assumes no liability for damage or injuries resulting from transportation. Transportation insurance can be agreed on separately on the customer's request and expense. The recipient assumes all risks and responsibility related with the safe storage, handling and use of the received strains. VTT is not liable for any direct or indirect damages arising from misidentification or misrepresentation of strains or any damages arising from the use of the strains. VTT does not grant any warranty for strains, expressed or implied, including but not limited to non-infringement third party rights. Complaints about contamination or non-viability can be accepted only if they reach VTT Culture Collection within thirty (30) days after the date of dispatch for active cultures and presupposing that the instructions for revival and cultivation have been followed properly.